It's been a crazy few weeks. Things have been coming at me so fast, I haven't really had a chance to do much more than just acknowledge them, so in the spirit of giving everyone a little justice, here we go. I've been playing solo acoustic at this cool little place in Aberdeen called Jugtown Grill. It's got a really cool vibe about it, and I have met some of the greatest people already. Coincidentally (shameless plug), I'll be back at Jugtown Saturday, August 2nd, so if you're looking for something to do, swing on by. The food is great and Sheila and crew will make you feel right at home. What was supposed to be an acoustic gig turned into a "band" show at the last moment in Hamilton for the Hamilton Appreciation Day celebration. Our good friend David Long played right before us and so we made use of him on Bass. Thanks, David, for sitting in with us again, and thank you to the people of Hamilton, Mississippi, for having us. I played a private solo show at the Tupelo Automobile Museum on the 16th for Mississippi Water and Pollution Control Operator's Association and had a wonderful time meeting people from all over the state of Mississippi, something I hope I get to do again in the future. 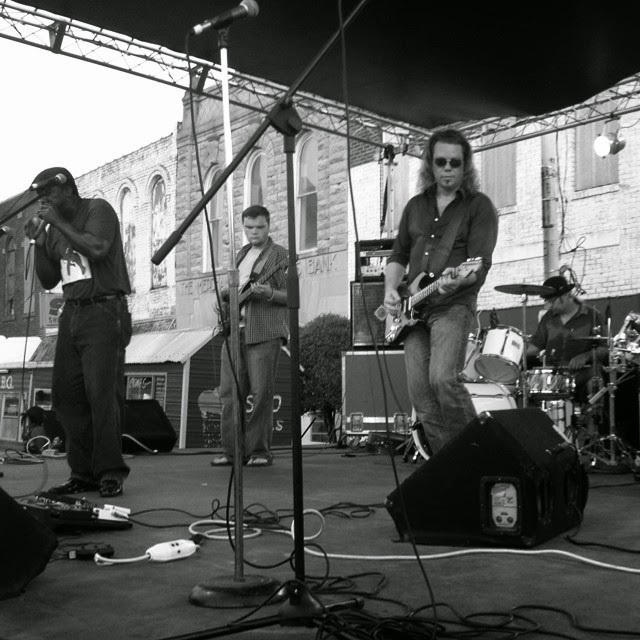 The Project also played the 4th Annual Okolona Magnolia Festival on the 26th, and even got to do a set with our friend Terry "Harmonica" Bean! The blues was sufficiently preached, that I can tell ya for sure. "Gone Bad Blues" was played on the air in Rolla, Missouri, Sunday night. The Basement Tapes with Nick and Bootsy on KKID 92.9 FM. You can click on over to their site to hear a stream of the broadcast. We want to give a shout out to Nick and Bootsy and say thanks for support. Hopefully, soon, we can come to Rolla and play for ya in person. This Saturday, Foosh and I are heading to Hernando, Mississippi, for an in-studio interview and performance for Mississippi Music Foundation. Keep an eye on the Facebook page or at KevinWaide.com for when it will air. As I said earlier, I'll also be at Jugtown in Aberdeen Saturday night starting at 8:00 pm. There's also the birthday bash coming up on August 15th at Woody's in Tupelo. I would LOVE to not remember you being there, so make your plans now. As a side note, as of right now (10:18 PM Thursday, July 31, 2014) we have had 5,133 views on the blog in just a little over a year and a half! Thank you all so much for supporting the music and the Project. We hope to be able to entertain you for many years to come.